I’ve been thinking, reading and teaching about how yoga influences neurobiology for a number of years. 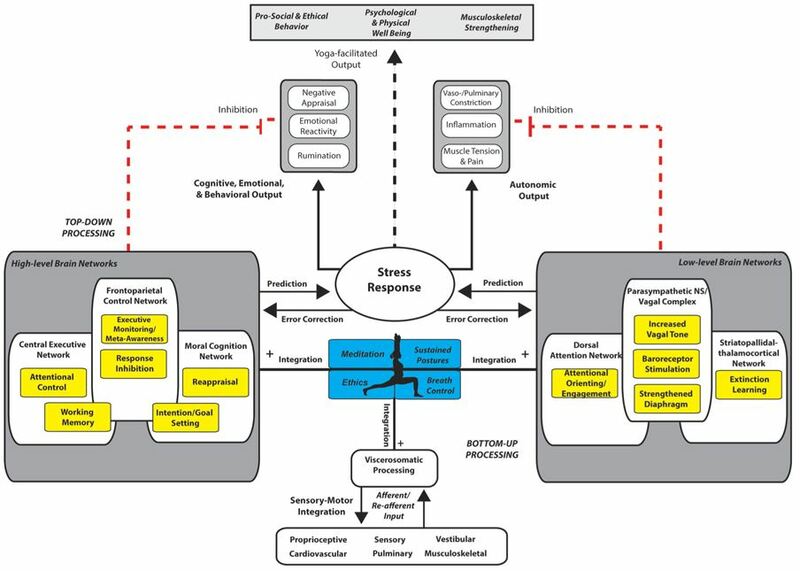 So when one of my students passed along a recently published article proposing a comprehensive model for the self-regulatory mechanisms of yoga, I got all dysregulated – increased heart rate, dilated pupils, sweaty palms, insomnia – it’s too exciting! It’s going to take me a while to break this stuff down, so I’m going to write several short blogs to try to cover the main themes. One of the things I most love about this is that it goes beyond some of the previous models (that only look at postures or pranayama) and defines yoga as ethics, meditation, postures and breathing regulation. That’s huge. When they start adding bhakti to the models I’ll have even more to celebrate. At this moment, I’ll happily take something more holistic than postures. I want to start with some perspective. As tools of measurement have gotten more powerful, specifically functional MRIs, scientists have been able to measure brain changes associated with practice. The kind of jump starter was Richard Davidson’s famous research at the University of Wisconsin in the early 2000s – remember, the cover of Time with the meditating monk with electrodes on his shaved monk head? People who meditate, Davidson’s research found, have thicker pre-frontal cortices. The implication is more front brain = better capacity to inhibit (your behavior, thoughts, actions). Good for mental health and health in general. 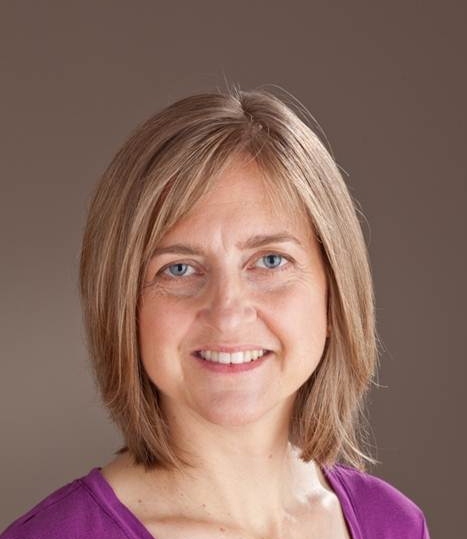 Lots of other research followed including Sarah Lazar’s work – she took non-meditators, taught them some techniques and after two weeks – Voila! Brain changes. So it’s not just 40 hour a week meditation professionals who benefit. Then Rick Hanson (who’s been dubbed “The Mr. Roger’s of Neuroscience”) made it a lot easier for us lay people to understand meditations effect on the 3 pound lump of tofu inside our heads. People like Bessel van der Kolk, Stephen Porges, Dan Siegel (and I would venture to add Rupert Sheldrake to this list although many label his fascinating research grossly “unscientific”), have expanded the definition of the brain and mind beyond the cranium. Tim Gard in Boston along with a team of researchers from all over the place, have put together a model of how yoga helps us self-regulate. Yes, a model! I know, it’s so exciting, I can’t stand it. And as my excitement induced insomnia subsides, I want to break this article down in separate blogs, so you can really understand a few key concepts and the profound implications for yoga on mental health. I want to frame this for those of you who want to help improve the very scary mental health situation we are facing as a society and globally (did you know the World Health Organization ranked depression fourth among the 10 leading causes of the global burden of disease? But that is another blog). Today I want to go into just one basic concept about how we self-regulate, (actually half of it): Top Down and Bottom Up. Top Down essentially means using the higher functions of the brain to help self-regulate. A lot of this originates in the prefrontal cortex. The Frontoparietal Control Network (FPCN) is the network in the brain that creates a sense of self-awareness, figures out what’s going on, and inhibits inappropriate responses. An associated network, the Central Executive Network, supports your attention and uses working memory to help you behave in a way that’s goal directed – and self-correct when you screw up. So here I am writing this blog, but occasionally I have to go to the web and check something out in an article or Wikipedia. And while I’m there, I’ll just swing over to Facebook and, Oh! that’s such a cute video of a cat swatting at an alligator over a chicken leg! Wait a minute, what was I doing? Oh yeah, I gotta finish that blog. You get the picture. Social media loves to challenge the CEN’s work. Finally the Moral Cognition Network supports motivation and intention setting and does good things for others and yourself. Sounds like the yamas and niyamas right? Morality is the foundation of yoga for a reason – there’s lots of research that links morality to better mental and physical health outcomes. It’s a powerful tool for self-regulation. So this is a summary of the top down processes that help us self-regulate. In the next blog I’ll cover bottom up self-regulation. And then (it’s coming!) how yoga influences these networks in really amazing, positive ways. To contine reading Part 3 of Kaoverii's blog see here.